Lake Hiller is a salt-water lake on Middle Island in the Recherche Archipelago, in the south coast of Western Australia. The lake is about 600 mts in length and is 250 mts wide. 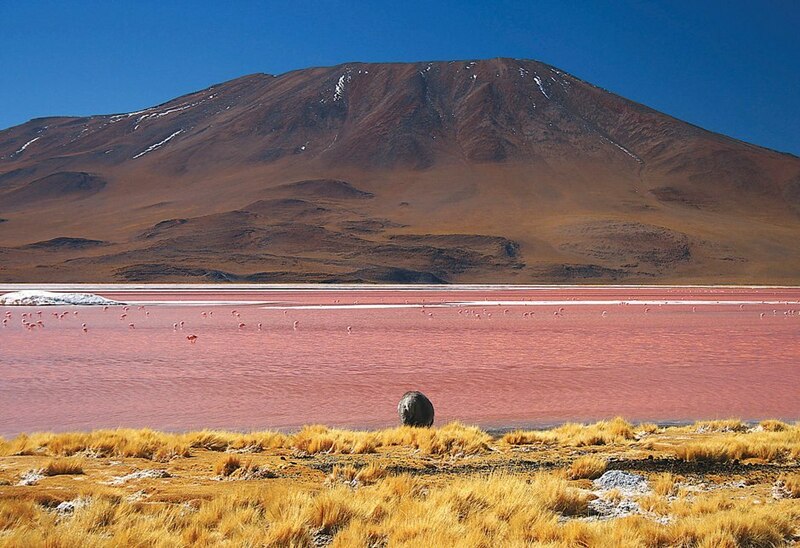 The lake is also called The Pink Lake because of its pink color. It pink color looks so bright as if someone has added pink dye to the lake. The southern ocean which is at some distance from the lake is however normal in color. The lake is surrounded by a belt of white salt and green eucalyptus forest. The color of the lake is because of the presence of a living organism Dunaliella salina, type of halophile green micro-algae. 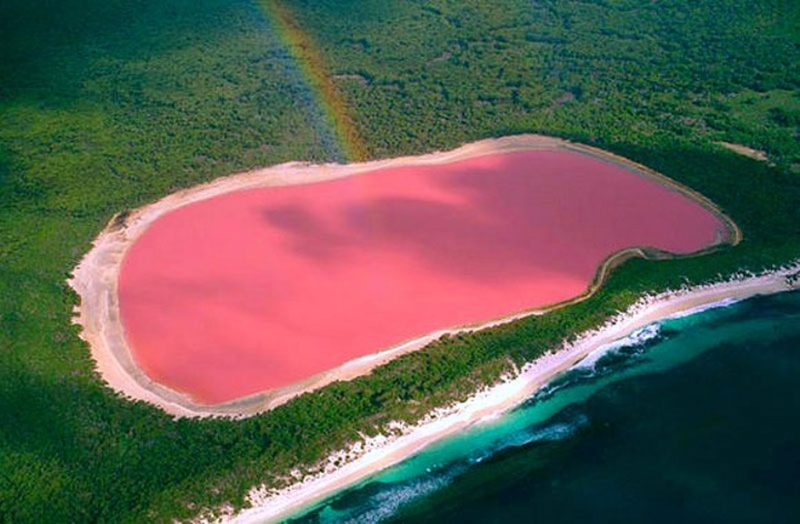 It causes the salt in the lake to create a red dye. Laguna Colorada is a saline water lake in southwest of Bolivia on the Chile border. The lake has red colored water. This bright blood red lake has white pools of borax deposits on the surface. The red color with contrast white white dots makes the lake a beautiful out of the world landscape. The red color of the lake is because of the red sediments and the algae in the water. The place attracts lots of flamingos. Very rare species of flamingos have made their home there, making the place a very attractive tourist destination. 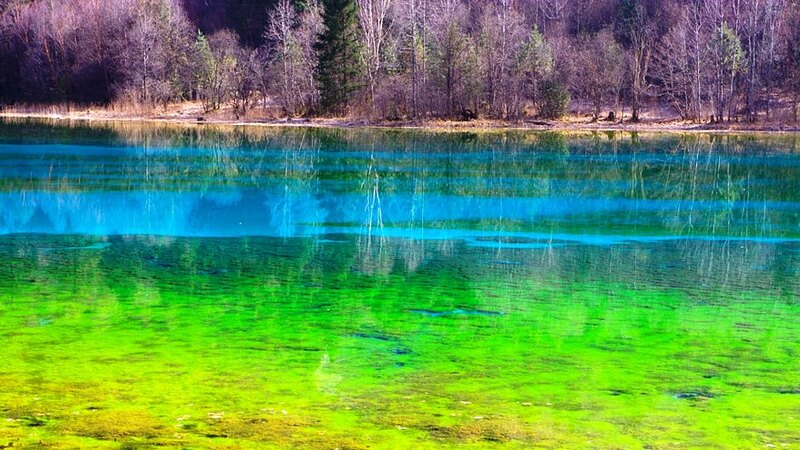 The Five-Flower Lake is located in the Jiuzhaigou National Park Jiuzhaigou in China. This beautiful lake sparkles with different shades of turquoise and the bottom of the lake is covered with ancient tree trunks, which surprisingly does not make the lake dirty but keeps the water clean and clear. Another thing about this lake is that it does not freeze in winter. Scientists are still not able to find the reason. This lake also changes its colors. Sometimes it appears yellow and sometimes green, but most of the time however it is clear blue. In the 1890s, Jiuzhaigou valley suffered from a 5-year drought, but Five-Flower Lake was still full of water. 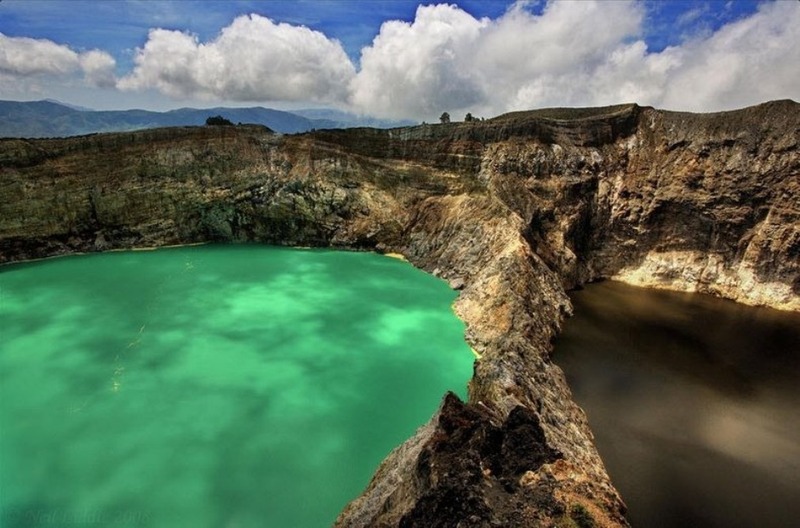 Mount Kelimutu is famous for its tri-colored crater lakes. These lakes are located on the eastern summit of Keli Mutu. Each lake is distinctively different in physical structure and has a unique geochemical and hydrothermal structure. The three lakes often change color. The volcanic gas in Kelimutu triggers a chemical reaction of the minerals in the lakes which results in the change in colors. As the three lakes have different mineral contents the colors of the lakes are different. The locals consider these lakes a sacred place being the home of the souls of the dead. So the other reason suggested is that the neglected ancestral souls change the colors of the lakes. The first lake is named Tiwu Ata Mbupu (lake of the old people or lake of the elderly and wise ancestors’ souls); the second is named Tiwu Nuwa Muri Koo Fai (lake of young men and maidens); and the third is called Tiwu Ata Polo (lake of evil spirits or Bewitched or Enchanted Lake). The Tiwu Ata Polo is on the east and Tiwu Nuwa Muri Koo Fai is in the center. These two lakes are close to each other and are separated by a shared crater wall. The third lake of the old people is the westernmost lake slightly away from the two.